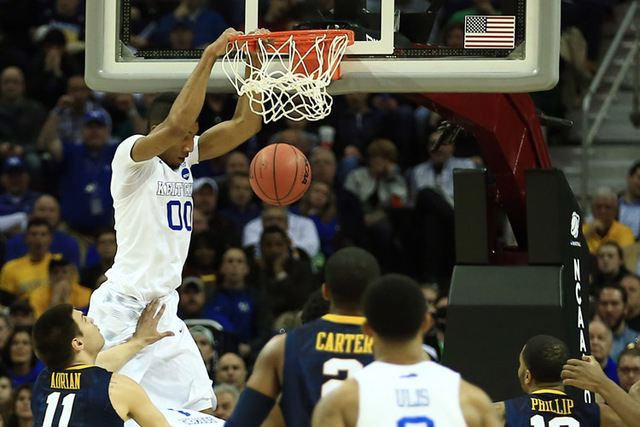 Forward Trey Lyles scored 14 points, and the top-seeded Kentucky Wildcats remained undefeated with an overwhelming 78-39 win over fifth-seeded West Virginia in the Midwest Regional semifinals Thursday night. 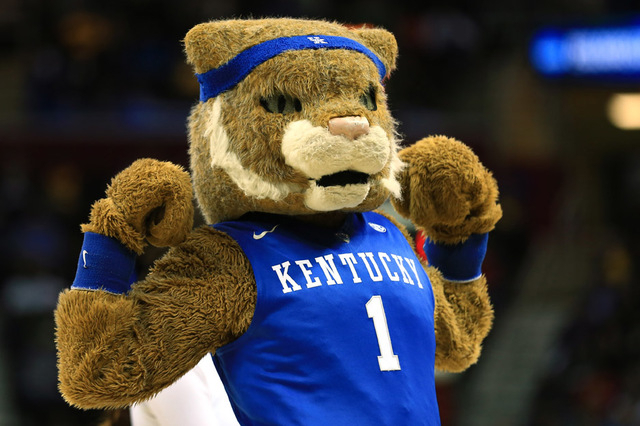 CLEVELAND — Forward Trey Lyles scored 14 points, and the top-seeded Kentucky Wildcats remained undefeated with an overwhelming 78-39 win over fifth-seeded West Virginia in the Midwest Regional semifinals Thursday night. Kentucky (37-0) faces Notre Dame (32-5) on Saturday, with the winner advancing to the Final Four. Five players scored in double figures in the Wildcats’ dominating win. Guard Andrew Harrison had 13 points, while guards Aaron Harrison and Devin Booker and center Dakari Johnson each scored 12. Guard Juwan Staten scored 14 points to lead West Virginia (25-10). 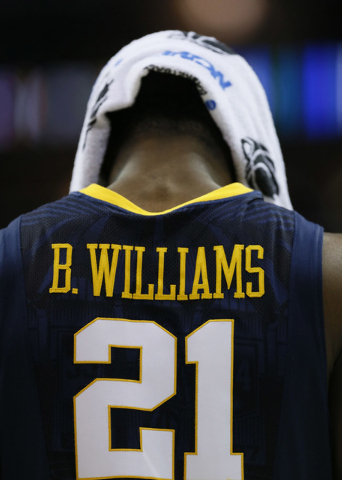 The Mountaineers defeated Buffalo and Maryland to advance to the regional semifinals but were no match for the Wildcats, who put the game away with a 16-0 run early in the first half. The Mountaineers were optimistic their relentless full-court pressure defense, which forced 40 turnovers in their first two tournament games, could create problems for Kentucky. Even that didn’t work, as the Wildcats only committed 10 turnovers. West Virginia gave the ball away 13 times. West Virginia guard Daxter Miles Jr. told reporters Wednesday that Kentucky is “gonna be 36-1” after playing the Mountaineers, a prediction the freshman likely wanted to take back soon after the game started. The Mountaineers wound up shooting 24.1 percent from the floor, while the Wildcats shot 48 percent. An overpowering display at both ends of the floor put Kentucky in command 44-18 at halftime. The teams exchanged baskets to start the game before Kentucky scored the next 16 points to take an 18-2 lead. 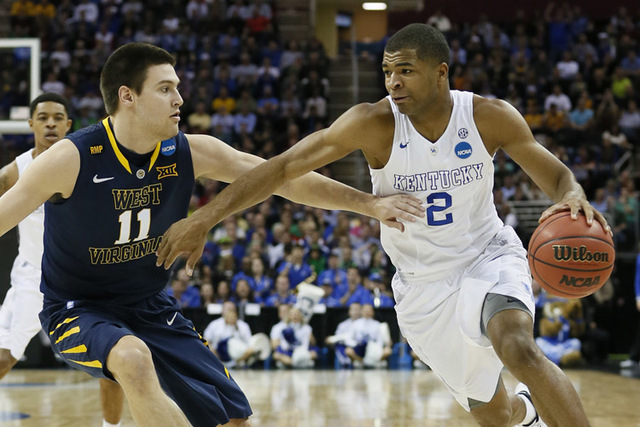 Aaron Harrison scored 10 points in the run, including back-to-back 3-pointers, a layup and two free throws. West Virginia coach Bob Huggins called timeout during the onslaught that lasted nearly seven minutes, but nothing could stop the Wildcats. A jumper by Staten finally ended the run. The numbers told the first-half story. Kentucky was 14 of 23 from the field and West Virginia was 5 of 26. The game featured a battle of high-profile coaches with Huggins going against Kentucky’s John Calipari. The two have been close friends for more than 30 years. Even after the loss, Huggins still has an 8-3 record against Calipari’s teams. NOTES: The teams met for the first time since 2011, a 71-63 Kentucky win. West Virginia, the second seed in 2010, upset the No. 1 Wildcats 73-66 in the round of eight in 2010. … The Wildcats advanced to the Sweet 16 for the 45th time and are a No. 1 seed for the 12th time. … The Mountaineers reached the Sweet 16 six times in their past nine tournament appearances.